There’s no reason why this should come as a surprise, we’ve known this day would come, and it finally has. This is of course being blamed on the budget impasse in Springfield. But the lack of a budget isn’t responsible for this, it only moved the date forward. Both sides sit down and agree that the current system needs to be scrapped in favor of a defined contribution system. There’s nothing in the Constitution that says that those to whom the promise of undiminished or unimpaired pension benefits have been made can’t voluntarily make concessions that would help relieve the pressure on the system. Why would they want to do that? It’s simple. As I said in an earlier post, even though the Constitution promises that benefits shall not be diminished or impaired, there’s no corresponding Constitutional requirement that the pensions be funded. That was left to the Legislature. When the money’s gone, it’s gone for good. Illinois has had ample opportunity to fix this mess, but the unions that are holding this state hostage refuse to do what’s clearly in their own best interest. There will come a day, and it will be soon, when the payments won’t merely be delayed, they’ll come to an end. While that’s going to hurt a lot of people, they’ll have no one to blame but the union bosses and their Legislative truffle pigs who formed the unholy alliance and made them a promise they knew would never be fulfilled. This entry was posted in Public Pensions and tagged Public Pensions. Bookmark the permalink. One Response to I’m Shocked! 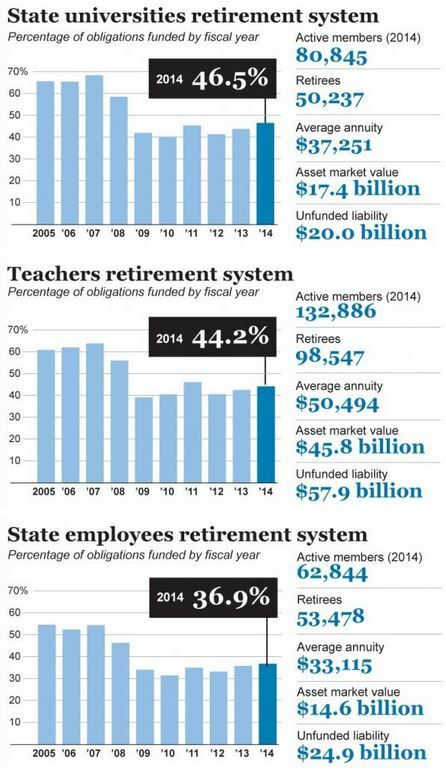 Shocked to Find That Illinois Can’t Make Its Pension Payments! There is NO MAXIMUM statutory rate for property tax levy to fund pension benefits for school employees. See last line for statutory (no ) max rate on pension funding. Interesting to also note that you can drive a fleet of school buses through the gaps in PTELL “protections”. The Transportation Fund statutory rate cap was lifted, so now schools just tax however much they want in Transportation Fund, and transfer it later to general funds.